King XI’s veteran West Indies opener, Chris Gayle. 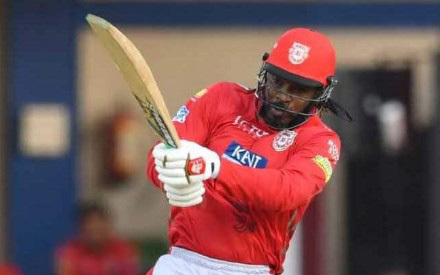 MOHALI, India, CMC – West Indies superstar Chris Gayle agonisingly missed out on his 22nd Twenty20 hundred but his efforts came in a losing cause as his Kings XI Punjab went down to Royal Challengers Bangalore by eight wickets in the Indian Premier League here yesterday. Playing at the IS Bindra Stadium, the veteran 39-year-old opener ended unbeaten on 99 off 64 deliveries as Kings XI, choosing to bat first, reached 173 for four of their 20 overs. There was further disappointment for Gayle as RCB captain Virat Kohli top-scored with 67 and South African AB de Villiers stroked an unbeaten 59, to get the visitors past their target with four balls remaining. The victory was RCB’s first in seven outings, leaving them still bottom of the standings while Kings XI suffered their fourth defeat in eight matches to remain fifth. Gayle had given the hosts a great start when he posted 66 off 38 balls for the first wicket with Lokesh Rahul who made 18. All told, the veteran 39-year-old opener crunched 10 fours and five sixes, as he raced to his half-century off 28 deliveries. Kings XI were cruising on 110 for two but lost two wickets for three runs in the space of six balls, and it was left to Gayle to keep the innings together in a 60-run unbroken fifth wicket partnership with Mandeep Singh (18 not out). Gayle started the final over on 90 and was 95 with two balls remaining in the innings. However, he played and missed at a wide one from seamer Mohammed Siraj and with five needed from the last delivery to reach three figures, squeezed a yorker to the backward point boundary. In reply, RCB were never in trouble after Kohli anchored an opening stand of 43 with Parthiv Patel (19) and then posted another 85 for the second wicket with de Villiers. Even when the Indian captain perished in the 16th over, de Villiers stayed firm to add 46 in an unbroken third wicket stand with Marcus Stoinis (28 not out), and see RCB home. In the other match at the Wankhede Stadium, Barbadian fast bowler Jofra Archer bowled superbly to help Rajasthan Royals to a four-wicket win over Kieron Pollard’s Mumbai Indians. The 24-year-old claimed three for 39 from his four overs as Mumbai were held to 187 for five off their 20 overs, despite opener Quinton de Kock’s 81. 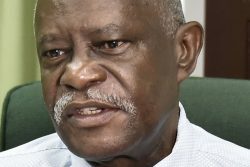 Pollard fell cheaply for six, caught at mid-wicket off Archer after being hurried into an ill-advised pull shot. Royals then overhauled their target with three balls remaining courtesy of Englishman Jos Buttler’s 89 off 43 deliveries.